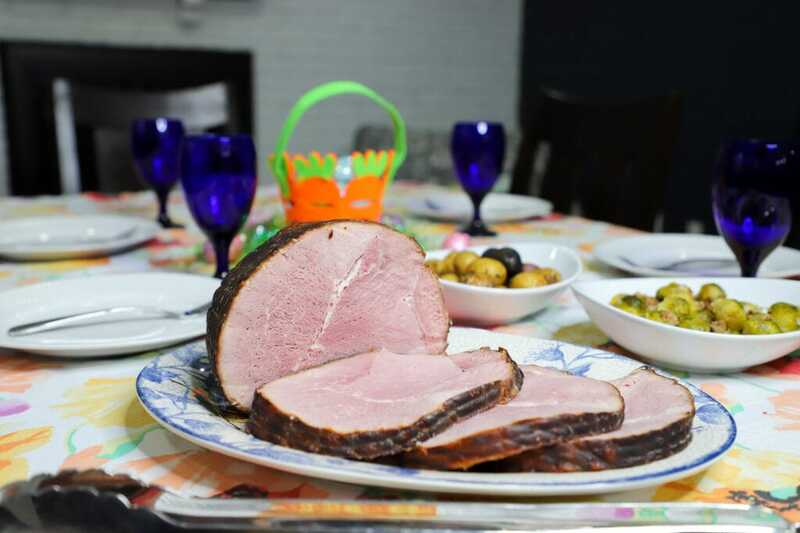 Lady and the Blog → Contest → The Best Country Ham For Easter – Plus Enter To Win A Ham Of Your Own! 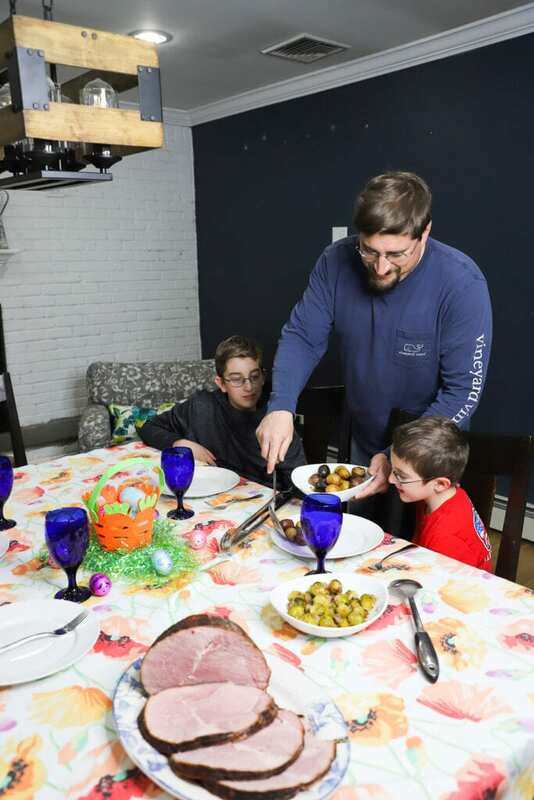 If you are looking for the best country ham for Easter, you are in luck. I just made the most fantastic meal using all Omaha Steaks products and it simply wowed my family. But enough about them, let’s talk about me – the COOK. I want to tell you all about the time you will save in the kitchen and how you won’t sacrifice any flavor or quality. That is a MEGA WIN and one that you cannot beat. As a mom… let me rephrase that… as a busy mom of three who runs her own business but still wants to make sure that she puts a great meal out for her children every single night, I am always looking for lifesavers. And you know what? Omaha Steaks has been just that for many years now. I’m lucky enough to have one of their stores pretty close by to my home and I frequent it all the time. The deals I find whenever I do are pretty incredible. When I started to think about Easter and what I wanted my day to look like, I knew that I wanted most of it to be spent with the people that I love. Holidays are many things, and the hostess usually doesn’t get to experience any of them. Hey! I’m just being honest, here. 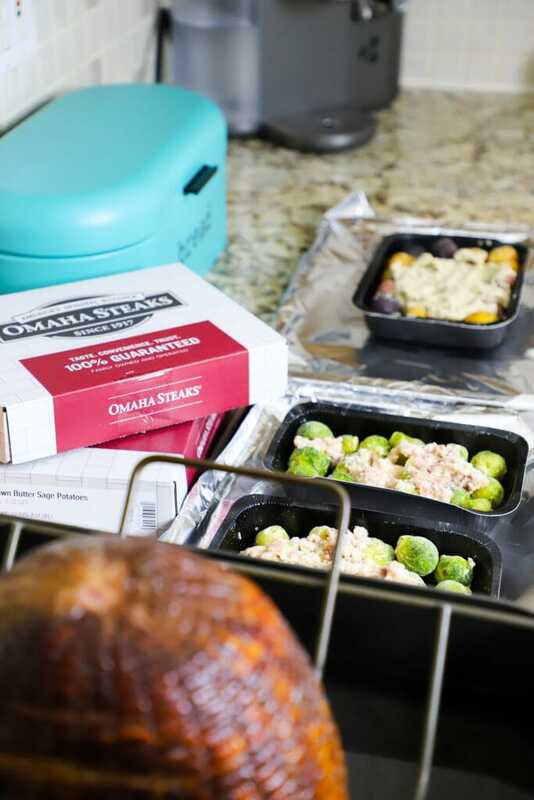 So, when I put together my shopping list, I decided to put together an Omaha Steaks holiday instead and opted for a Country Ham that melted my tastebuds and made Bill propose to me again. Is that strange? That my husband is easily swayed by pork? Whatever – that’s why I love him. I wanted to do a test run before the big day when I plan on inviting over my mother, grandmother, and a few cousins. And I am so glad that I did because the menu I put together was simply divine! In case you are in need of some inspiration for your Easter menu, here is my official breakdown. 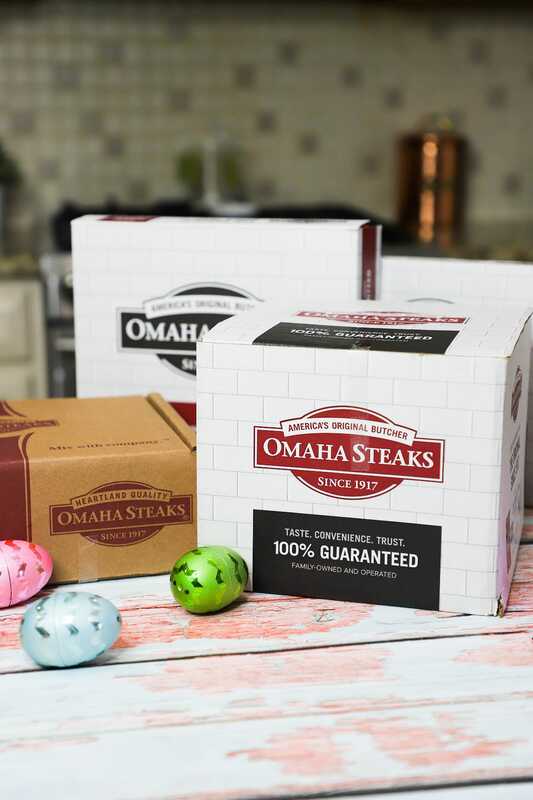 Perhaps, you’d like to make an Omaha Steaks holiday of your own. LOL! What’s great about the Country Ham is that it is a heat and serve. You can keep it in the freezer until the day before your guests are set to arrive. Then you need to let it defrost in your refrigerator for around 24 hours prior to heating. Since you are truly just heating the product, you won’t spend as much time in the kitchen which means that you get to spend more time with grandma! Yeah – total win!! 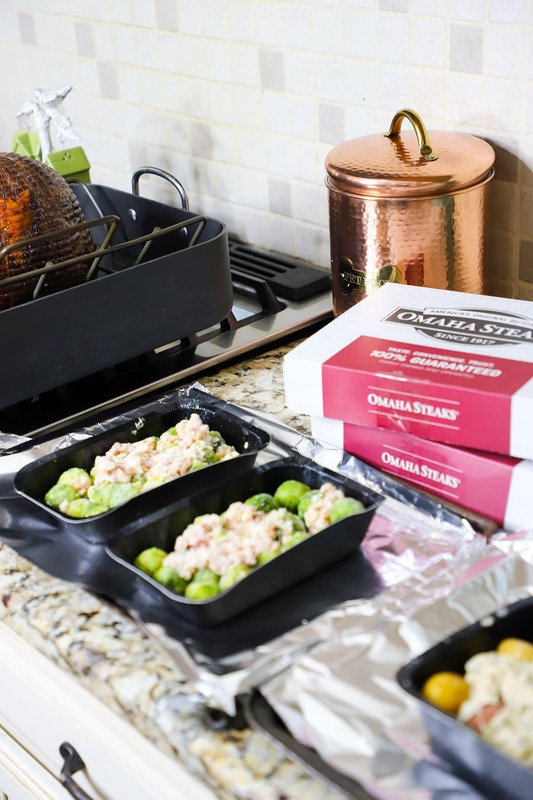 Even my side dishes came from Omaha Steaks this year and they were all insanely delicious! Oh, my word! Brussels sprouts with bacon and shallots? Who could say no to that? Nobody that’s invited into my home. That’s who! And what holiday isn’t complete with a side dish of potatoes? Since it’s Easter we get to indulge a bit. So, I opted for potatoes that were covered in brown butter sauce. They were as good as they sound. Truly. To round out the entire evening, we gave a little nod to the Easter Bunny and brought out two-layer carrot cake that the children devoured. 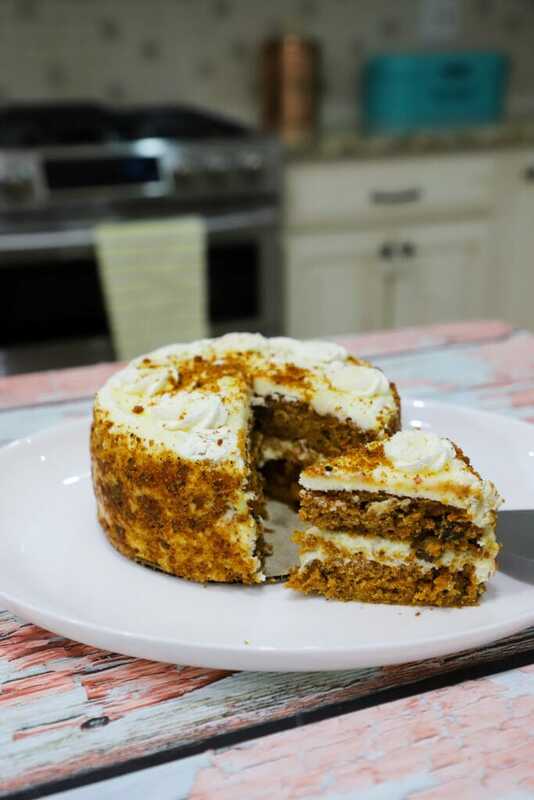 I just LOVE carrot cake and for some reason, I only eat it during this time of the year. Easter! It’s such a great flavor… I don’t know why it’s not more of a year-round dessert? I feel like I want to change that. At the end of the night, the kids cleared up the plates and we all decided that ham needs to be on the menu more often. If you have any ham left, don’t forget about all the delicious sandwiches you can make during the week! Or if you’d like, you could also make a beautiful ham soup or a quiche. More of a salad person after a heavy dinner? Dice up your ham and throw it into your favorite bed of greens. Don’t want to wait for lunch? How about tossing some into your morning omelet. Ham is super versatile! There are plenty of recipes that you can make using leftover ham. The options are limitless. I am giving away a ham of your choice! You can either choose the Spiral-Sliced Ham, the Duroc Country Ham, or the Smoked Ham. Completely up to you. To enter, all you have to do is fill out the form below. Participants must be US residents and 18 years or older. Best of Luck!! This is perfect for Easter! Yum! And I would like to win the spiral ham. I want to win the Duroc bo else’s ham, it looks delicious! This would be wonderful for our huge family. Sprial all the way! My favorite is always a spiral ham, but I would love to try the Country Ham! i WOULD LOVE TO HAVE THE COUNTRY HAM! I would choose Spiral-Sliced Ham. I love spiral ham! Sounds delicious and perfect for Easter. I would probably go with the spiral-sliced ham. We usually buy spiral sliced. I love ham, even on holidays like Thanksgiving when most people eat turkey. I would love the spiral cut ham. Spiral ham is always so good would love to have one. Im going with spiraled ham! Mmmm…I’d love a spiral ham- they’re delicious! I would also prefer a spiral sliced ham. I’d probably use it for our church potluck and it is so much easier to serve a spiral, than to have to slice it myself. I’ve never met any kind of ham I didn’t like..but I’ll go with the Spiral Ham. 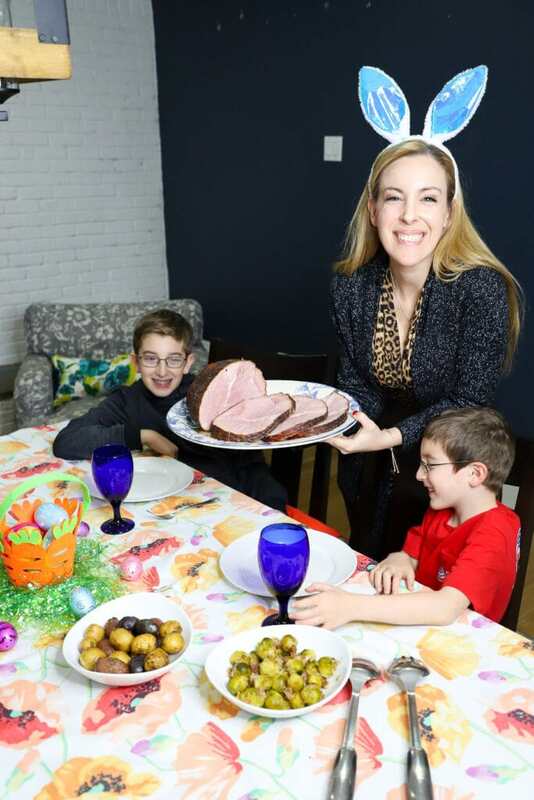 I would love to serve the family the spiral ham for Easter, thanks so much for the opportunity! I would pick the Spiral Sliced Ham. I would LOVE the spiral sliced ham 🙂 Thanks for the chance!! The spiral sliced ham for me! I’d like to win the Duroc Country Ham. 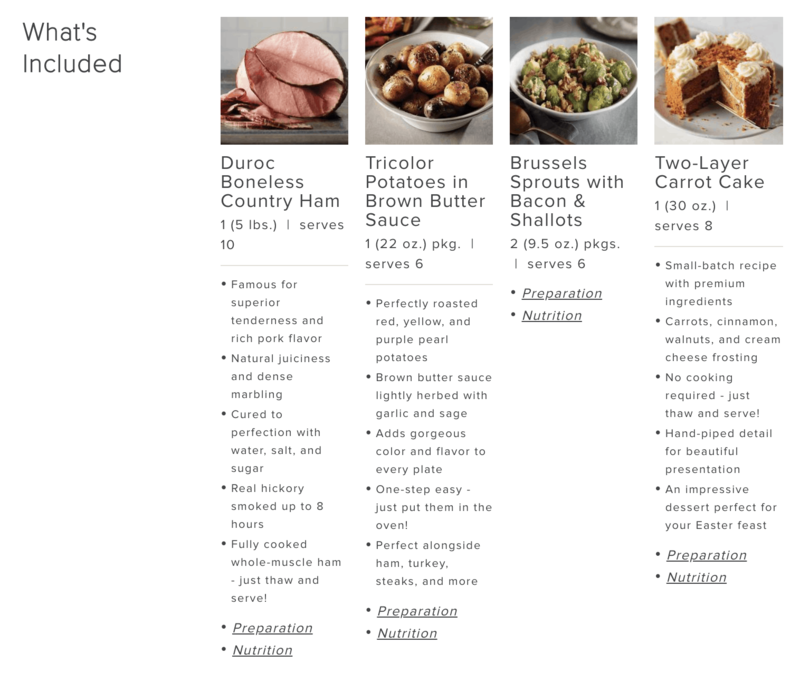 The Duroc Boneless Ham …. Gosh, it’d be amazing to have ANY. Spiral, I think. The Duroc Boneless Country Ham. I would like the Duroc Country Ham. All of the hams look good but I would probably choose the spiral ham. I always enjoyed the spiral sliced ham, it is so good! I would like the Spiral Sliced Ham. There is nothing better than a good ham. the spiral sliced ham sounds delicious! I’d like to try the spiral sliced ham. I’d love to have the spiral sliced ham; thanks. I would love the spiral ham. I love any Ham with homemade horseradish! Normal I get Spiral Hams, but I think I would love Disco Country Ham so I can make Pot pie or Cabbage, potatoes and ham with left overs! Thank You I have not celebrate Easter for 2 years due to losing my Sister & Mom in the Fall of 2017 and was in hospital in 2018 because of my MS has Progressed! Currently just going to start a NEW Medication Ocverus a brand new Medicine for MS. Thank You for considering me because it is difficult for me to go shopping at this moment! Spiral sliced ham and some pineapple would be perfect for Easter! I would like the Spiral Sliced Ham please. Iwould love to have the spiral sliced ham. I must say the Country ham looks delicious too! I love ham any ham will do for me! Country ham all the way! It looks amazingly delicious!! I love country ham, so that would be my first choice! I would choose the spiral ham. Thank you! I would be grateful for any harm. If I could choose I think I would go with spiral. I would love a Spiral-Sliced Ham! That is our favorite! Hope I win the ham! I’d love the spiral ham!! This looks so good. Would love the boneless ham. Yum!! I would love to try the spiral ham. Spiral sliced or smoked ham. My family’s must-have for the holidays is a ham! I would love the Spiral-Sliced Ham. I’d love the spiral sliced ham! The duroc ham also looks delish! What a fab meal this would make! i would pick the spiral ham as well so much easier to cook slice and serve and the are so tasty! If I won I would choose the spiral sliced ham. I would love to have any of these actually. But to choose one I would pick the smoked ham. Probably the country ham but I love it all and would be hard to decide for me. I wanna taste it all. I would LOVE the spiral sliced ham! It would be a hit at my house! Would love the spiral ham. Any of them would be great but the one that I would most like to win is the Spiral Sliced Ham. I would choose the Spiral-Sliced Ham. Still trying to have Easter here at my home (grandma’s house)….but I’m getting too old I think..this would be perfect and let us continue the tradition for another year…. The spiral ham would be yummy! Spiral Sliced ham would be amazing to win! I would choose the Spiral Sliced Ham. I would love the Spiral-Sliced Ham it’s so delicious! My family and I would love the spiral ham. I’d pick the smoked ham hands down. I’m sure the others are equally delicious, but I’m one of those people that like the richness that the smokiness seems to add to ham. Definitely our family loves smoked ham, it has that extra good taste that helps to make the meal perfect. We’d like the country ham! I would love to win the Duroc Boneless Country Ham. Thank you for the chance to win! I would love to win a spiral ham! The Duroc Country Ham sounds really good. We love spiral ham! I made a bourbon ham this week in the instant pot. I love a smoky taste. I’d love to try the smoked ham this Easter. Your delicious spiral ham please! 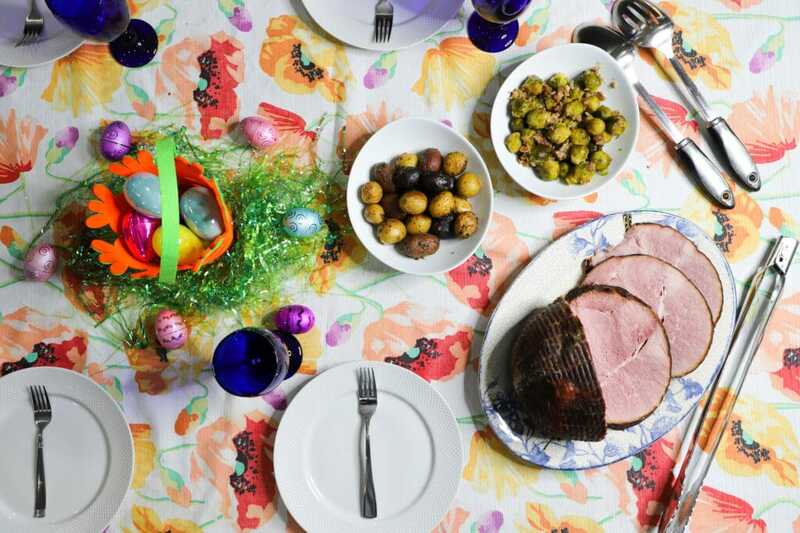 I would love to win a Duroc Country Ham for Easter dinner! I would like the Smoked Ham. I would for sure choose the Spiral-Sliced Ham.. I would love to try the Duroc Boneless Country Ham. I’d love to win the Smoked ham- I’d use the leftover scraps to make fantastic omelets with a smokey kick. The country ham would be my choice. Thanks for the great giveaway. I would love to win the spiral sliced ham.